Frugal desserts and puddings are often difficult to put together in a short time frame. Yes, you can boil down berries with a little lemon zest and sugar, but serve you well on a special occasion it will not. 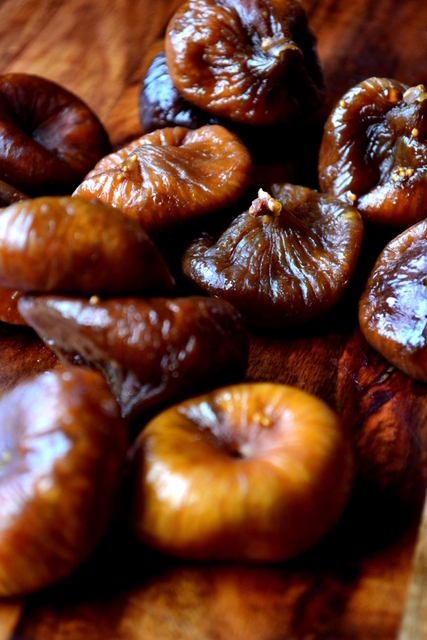 This simple recipe for Dried Figs in Honey, however, ticks all the boxes. Not only does it take a matter of minutes to “throw together” it is sweet, decadent and satisfying. Fresh figs are an incredibly perishable fruit, only able to last a few days before succumbing to the inevitable rot. As such, figs are often preserved, like other fruit, through drying. Dried figs last for far longer, often in excess of many months, and as with other dried fruit have a more intense sweetness and denser texture than their fresh counterparts. Though already very sweet, figs pair brilliantly with honey. 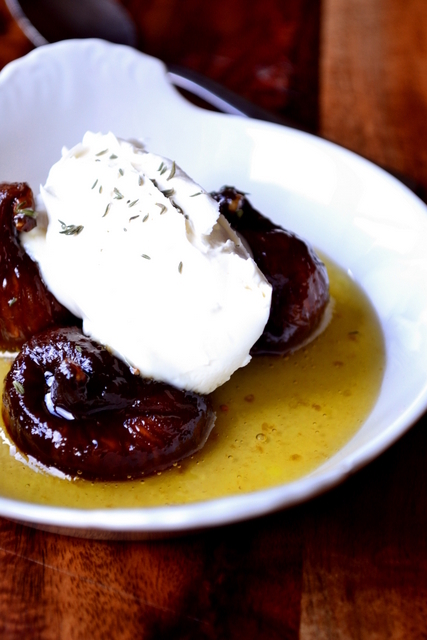 Fresh figs are, in my opinion, best served simply drizzled with a little runny honey. Whereas, dried figs are divine cooked in honey and allowed to puff up and warm through. These are very dangerous waters if you don’t have a particularly sweet tooth. If decadence is your thing, this recipe will yield a perfect, simple dessert. * Many thanks to my Grandfather for the inspiration for this dish, something he has been serving up to me at lunchtimes for quite some time. In a small pan bring the honey, oil and water to a gentle simmer. Place the figs in the honey, put the lid on the saucepan and leave for 3-4 minutes until the figs have heated through. 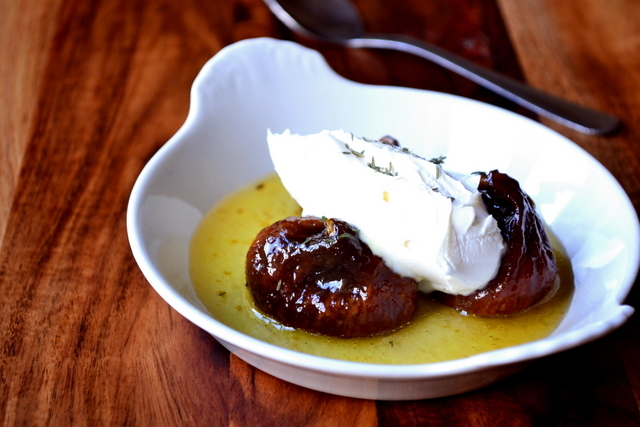 Place three figs in each dish and drizzle with the remaining honey. With two dessert spoons form your mascarpone into two quinelles and place atop the fruit. Sprinkle a little fresh thyme over each dish and serve immediately. Coffee should be nearby. Cost: Compared to fresh figs, dried figs are relatively inexpensive. If you look in the right places a 500g bag of dried figs can be purchased for as little as £2.30. That price equates to around 10p a fig, perhaps a little less. For that reason, this dessert has proved itself fantastically frugal and should set you back no more than £1.60. What a beautiful recipe, so simple! Very tasty looking stuff Nick. I do have a very sweet tooth and this looks simple and very tasty. So very, very tasty, Conor. This looks absolutely delicious and decadent. 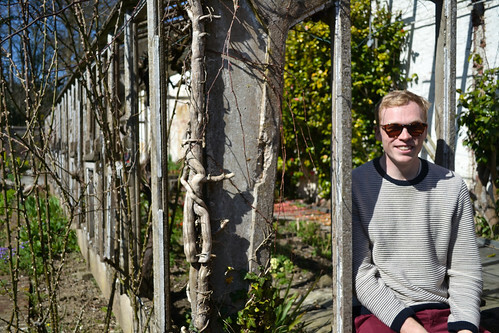 Craving figs and holding my breath until they are back in Holland! 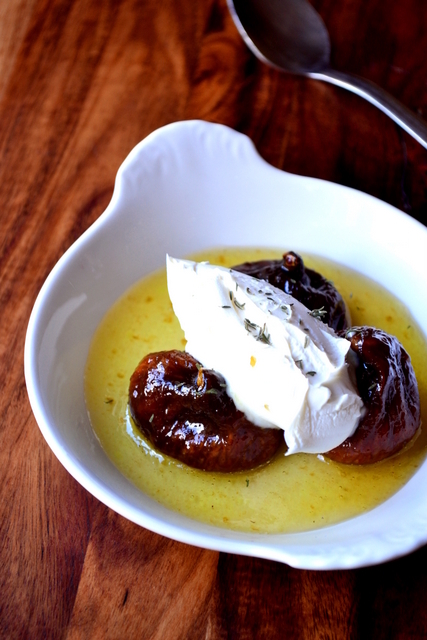 Fingers crossed for you and more fig recipes on their way! This is the perfect dessert: Warm, sweet, and rich. I love the simplicity and the touch of olive oil. I agree 🙂 – yes, the touch of oil was a good addition. What a lovely recipe! Simple and tasty! Thank you – I loved it. Wow this does sound very sweet but I bet they pair perfectly with a good dollop of greek yoghurt. Oh absolutely – it’s such a quick, delicious dessert. I have always loved this combination! Looks really divine, Nick. And simple!